← Smoking, drinking and gambling…. Tip # 6 .... EAT , EAT, EATTTTTTTT!!!! I have traveled to many countries but have never seen or eatn such awesome food!!!!!!!!!!!! They are a country that prides themselves on their food. Most families are not wealthy but they eat soooo much awesome healthy food!!! Ajvar is a great treat for those that have never been to Serbia. It is a added condiment like ketchup but has soooo much taste.. it is made with Eggplant, peppers and spice!!! I was in love the first time i sampled it!!! I love to add it to my hamburgers and add cheese for a dip!!! Cevapis are a MUST have too!! They are made from rolled up bits of hamburger in a bun the size of your head and great with ajvar, sourcream and onion!!! My all time favorite and most unique serbian food is Sarma!!! It is made from soured cabbage with rice and meat rolled into it!!! They eat it a lot on their holy “slava” or saints day!!! You have to have it!!! I could eat them all day!!!!!!! Serbs are the only ones who have Slava. Greeks have Name Days but that’s not the same. So yeah, it would be a good post for him. @Charles – Make sure you get good facts and details from friends though about Slavas. Not all in info found in English online is correct. I taught that too… but, no! Hey! just to precise, Sarma is a turkish dish that was spread to the Balkans during Ottoman Empire’s reign, but I guess Serbian’s developped a personalized one. We still say sarma in Turkey too. 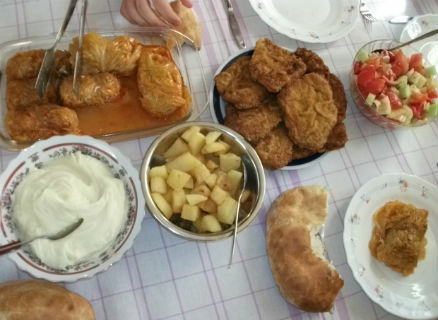 Also, there are other turkish food common in balkans, such as Borek. thanks for reading, my man… it means a lot… i will have a documentary coming out soon!!! Long live sarma & rakija! I’ve been living in Serbia for over a year now and that is really my only complaint other than working wages is the food. For me it is lacking in spice and overall taste. I am from the deep south however so maybe my bar for spicing up food is a little high. I prefer my bacon still cooked which my wife thinks I’m nuts for doing and she thinks I’m even more crazy for using the bacon grease in other food. I miss American hot sauce also. The hot sauce here is more like ketchup and not hot enough for my taste and the beer is nothing to write home about. Oh how I love Rakija though. Its the best stuff ever! Anyway, keep up the good work on your blog and showing the world the true side of Serbs and their beautiful country. DUDE!Thank you!We Serbians love eating aivar,sarma,gibanica…i know we do not have doritos and mountain dew but we have coca-cola,pepsi,fanta,bravo is a great juice if you want a great apple juice!Come back any time!You’re welcome!